Wolfram was first discovered here during a 1898-1906 expedition into the area looking for gold, led by Allan A. Davidson. One of the party, D. Pedlar, showed Davidson a wolfram specimen found, but there was little interest. In 1913, the Northern Territory Director of Mines, T.J. Oliver was at the Barrow Creek pub, inbetween looking for wolfram, which at that stage was at a high price. He overheard Pedlar talking about a place he had found wolfram, and he agreed to show Oliver. The first lease was registered by Hanlon and Warne in 1915. Some limited mining took place between 1916 to 1920, when due to the field's remoteness and low tungsten prices it was abandoned. Mining revived in the late 1930's, then late 1940's to early 1950's before been abandoned for good in 1957. Production figures are unreliable. During World War Two, 500 indentured Chinese labourers from Nauru were evacuated to Australia, due to the imminent invasion of the island by the Japanese. The Chinese had been working the phosphate mine on the island for the British Phosphate Commission, and the Australian government thought it a good idea to send them to Hatches Creek, and Wauchope to help them explore for wolfram. Nobody was happy with the situation. The existing local miners complained they were thrown off their mines, and the issue was raised in parliament. The matter of compensation was addressed after the war. It was claimed there had been an 83% reduction in wolfram production since the Chinese arrived, and they had been uncooperative. The Chinese Consul intervened stating the Chinese were living in shocking conditions, had not received wages promised, food was denied when they went on strike, union visits had been banned, and various other complaints. Hatches Creek is about as far from the conditions on mainland China as possible, let alone the swaying palms and aquamarine waters of Nauru. The army medical officer ordered the camp to be bulldozed and burnt in a huge bonfire due to health reasons. This would indicate conditions were squalid, although local miners even up to the 1950's were living in tin shacks, and bough shelters on the field. With no way home, and virtual slave-like conditions, its understandable the Chinese miners were unhappy. Ryan (The Geology and Mineral Resources of the Hatches Creek Wolfram Field) produced a remarkably detailed report in 1961. It is really the be-all and end-all on geology for Hatches Creek, of which only a brief summary can be included on Mindat. Wolframite is the commonest ore on the field, with some mines containing high levels of scheelite, a few copper, and the Pioneer mine bismuth and minor gold. Country rocks are various sedimentary rocks, volcanic rocks, intruded by the Pedlar Gabbro. 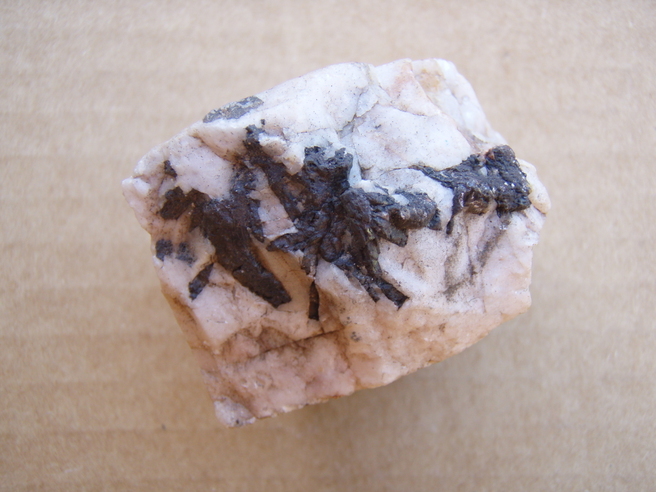 Greywacke is the most common sedimentary rock in the lower portions, quartz-sandstone in the middle depths, and quartzite in the upper portions, with beds of siltstone throughout, and minor conglomerate. Volcanic rocks include acid amygdaloidal porphyry with quartz filled cavities, some andesite, and lamprophyre. The rocks are moderately folded and faulted, generally dipping 55 degrees south, striking east south-east to north-east, then east. The deposits are between the Mia Mia Fault zone to the west, and a less distinct faulting zone to the east, between intense fracturing. The ore minerals are found in quartz veins traversing these rocks. Nearby granite is thought to be the source of the mineralisation, with numerous faults and shears aiding the flow of mineralised fluids. The quartz reefs are found in the shears , usually parallel to each other or en enchalon. Dips and strikes vary from group to group. Much eluvial wolfram was also obtained from gullies. Wolframite is found as metallic grey bladed crystals, radiating clusters of crystals, or dark massive forms. Scheelite is common is some of the mines, being 60% of the ore at the Pioneer mine. Bismuth minerals are also abundant at Pioneer. Bismuthinite is found as light grey fibrous patches. Bismutite as yellow earthy material in the oxidised zone. Secondary copper minerals range from a trace to half the metallic minerals in some lodes. They are abundant at the Hit Or Miss, and Copper Show mines, some said by Ryan to be of striking beauty. Chalcocite was mined at the Silver Granites mine, while malachite is common at the Copper Show mine. The various secondary copper species are associated with the wolfram. Molybdenite is relatively common, most abundant at the Hit or Miss mine, along with wulfenite and galena. Limonite, quartz, muscovite, and biotite is abundant at all the mines. 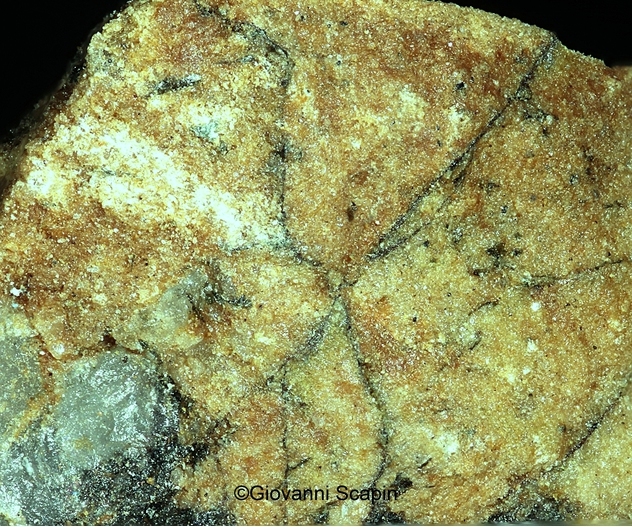 Only minor cassiterite is found on the field, unlike other wolfram fields in the region. There is little zoning of the deposits. 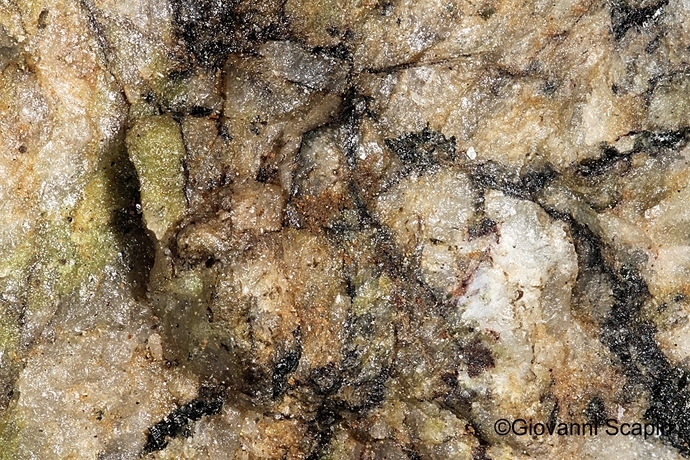 Three types of mineralisation is found on the field: 1) wolfram-copper ore, in volcanic rock, with scheelite rare, and gangue minerals virtually absent 2) wolfram-scheelite ore, found in the reefs hosted by the Pedlar Gabbro, with abundant scheelite, and bismuth minerals common 3) wolfram-only ore, both in sedimentary and volcanic hosted quartz veins, virtually only wolfram, quartz, and mica. Wolfram deposition is influenced by faults intersecting reefs, horses of country rock in the lode channels, splitting of lode channels, intersections of reefs, small fissures leaving the reefs at a low angle, and restrictions in the width of the lode channels. Wolfram enrichment is erratic, and can be localised.